We have been busy at Tresarran this year and thought we would keep you up to date with developments, offers and news so we can stay in touch. In 2017, we have made a number of improvements to Tresarran to enhance the holiday experience for our wonderful guests. Over Easter, we completed the resurfacing of our driveway and car park using local slate. This means our guests have a much easier experience between the car park and the cottages. We have also undertaken significant gardening, groundwork and drainage work as part of this. The dell area is particularly pleasing as we have developed a wildflower bank which attracts a variety of wonderful (and sometimes rare) flowers, which also brings butterflies, moths and other brilliant mini beasts for us to enjoy. We are committed to working with the natural and unique landscape here at Tresarran, and truly feel honoured to be surrounded by such a wealth of flora and fauna. We would like our guests to enjoy these for generations for come and our work in these areas will enable this to happen. We are delighted to offer our returning guests 10% discount on a weeks stay in 2018. We value our returning guests and would love to see you all again next year. To take advantage of this offer, please use the code RETURN2018 when booking on our website www.tresarran-cottages-cornwall.co.uk or call us on 01579 320558. We now offer a breakfast box to guests to order ahead of their stay. All of the produce in the box is sourced from local farms and businesses and really celebrates the fantastic quality of local Cornish produce. The breakfast boxes are £19.00 and contain sausages, bacon, butter, eggs (from our own free range hens), jam, apple juice and a loaf of granary bread. Please let us know when booking if you would like to order. How lovely to be able to experience a relaxing, full-body massage in the comfort of your own cottage. We have teamed up with Jenna from A Touch of Beauty who will come to your cottage and offers a range of relaxing massage options. Please do book your holiday for 2018 as soon as possible. We are nearly fully booked and would hate our regular guests to miss out. You can either book on our website, or call 01579 320558. The deposit is just 20% and will secure your dates for next year. We have a few dates left before Christmas if you fancy a cosy getaway. 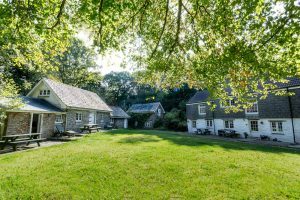 We pride ourselves on offering great value family and dog-friendly holidays in the Cornish countryside. We hope to see you very soon.